Add a chic coffee table to bring a bit of dressy modern style to your living room. The beveled glass table top creates an open display area that is perfect for decorative objects, framed photos, or your favorite coffee table book. The bottom shelf provides extra storage space. Position this coffee table easily with the help of four wheel casters installed into the table base. Stylish as well as functional, the table features contemporary design accents like a bold concentric circle lattice, block legs, and beveled edges. The Adrian Contemporary Coffee Table with Beveled Glass Top and Casters by Jofran at Crowley Furniture & Mattress in the Kansas City Area: Liberty and Lee's Summit, MO & Overland Park, KS area. Product availability may vary. Contact us for the most current availability on this product. Choose the occasional pieces from the 966 Panama Brown collection for a chic, stylish way to accent your living room decor. 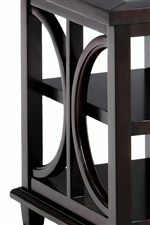 End table, chairside table, coffee table, and sofa table feature a cool modern design with concentric circle wood lattices and beveled glass table tops. 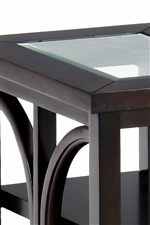 This collection is comprised of sturdy tempered glass and hardwood solids with cherry veneers, guaranteeing furniture that can stand up to the trials of daily use. The Adrian collection is a great option if you are looking for Transitional Contemporary furniture in the Kansas City Area: Liberty and Lee's Summit, MO & Overland Park, KS area. Browse other items in the Adrian collection from Crowley Furniture & Mattress in the Kansas City Area: Liberty and Lee's Summit, MO & Overland Park, KS area.